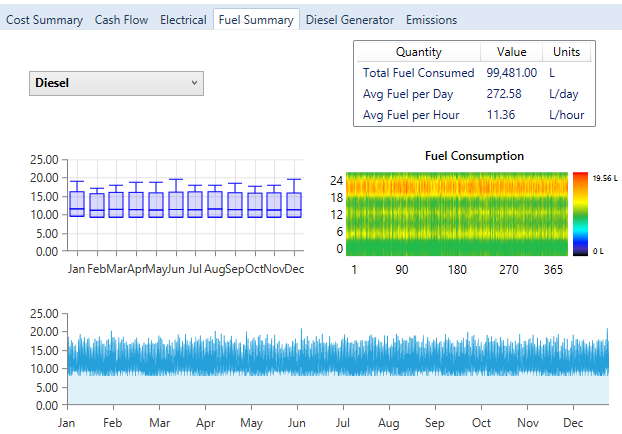 To view a report summarizing the fuel or fuels used in the simulation, click the Fuel Summary tab on the Simulation Results window. The Fuel Summary tab appears whenever your model includes components that use a fuel resource. The Fuel Summary includes a drop-down menu where you can select one of the fuels you used in your model. For each fuel, the Fuel Summary tab reports the total quantity consumed and the average consumption per day and per hour. The Fuel Summary also includes a box-and-whisker plot of monthly consumption statistics, a Fuel Consumption DMap, and a line plot of hourly usage.